Welcome to the New World of Distribution. Many filmmakers are emigrating from the Old World, where they have little chance of succeeding. They are attracted by unprecedented opportunities and the freedom to shape their own destiny. Life in the New World requires them to work harder, be more tenacious, and take more risks. There are daunting challenges and no guarantees of success. But this hasn’t stopped more and more intrepid filmmakers from exploring uncharted territory and staking claims. Before the discovery of the New World, the Old World of Distribution reigned supreme. It is a hierarchical realm where filmmakers must petition the powers that be to grant them distribution. Independents who are able to make overall deals are required to give distributors total control of the marketing and distribution of their films. The terms of these deals have gotten worse and few filmmakers end up satisfied. Mark’s keynote focused on the distributors, production companies, studio specialty divisions, and foreign sales companies that dominate independent film in the Old World. Mark has many years of experience in this world. He was President of Miramax Films, then head of Warner Independent Pictures, and is now CEO of The Film Department. He sees things from the perspective of a seasoned Old World executive. I see things from the filmmaker’s perspective. For the past 11 years, I have been helping filmmakers maximize revenues, get their films seen as widely as possible, and launch or further their careers. From 1997 until 2002, I experienced the deteriorating state of the Old World of Distribution as head of IFC‘s Next Wave Films. After the company closed, I discovered the New World of Distribution in its formative stages. A few directors had already gotten impressive results by splitting up their rights and selling DVDs directly from their websites. Filmmakers started asking me to advise them on distribution, and, before I knew it, I was a “distribution strategist” working with independents across the country and around the globe. Since late 2002, I have consulted with more than 500 filmmakers. While some have taken traditional paths in the Old World, many more have blazed trails in the new one. I’ve learned from their successes and failures and had the opportunity to share these lessons with other filmmakers, who then have been able to go further down these trails. It has been very exciting to be able to participate in the building of the New World, where the old rules no longer apply. Many of the rulers of the Old World continue to look backwards. Having spent their entire careers in this realm, played by its rules and succeeded, they can’t see past the limits of their experience. For them, the Old World is the known world, which they refer to as “the film business.” They explain away the serious problems facing the Old World by citing the film glut, higher marketing costs, mediocre films, and the historically cyclical nature of the industry. They appear to believe that everything will be just fine with enough discipline and patience–if fewer, better films are made, costs are controlled, and they can hold out until the next upturn. Many of these executives seem unaware of the larger structural changes threatening their world. They recognize that video-on-demand and digital downloads will become more significant revenue streams but seem confident that they can incorporate them into their traditional distribution model. These executives do not understand the fundamental importance of the internet or its disruptive power. By enabling filmmakers in the New World to reach audiences directly and dramatically reducing their distribution costs, it empowers them to keep control of their “content’. The Old World executives who do acknowledge the New World can be as dismissive as record industry executives were when they first noticed the internet. Their usual condescending response is the internet may work for “little” films with “niche” audiences. After admitting that the internet represents added competition for eyeballs, they are quick to point out that little money is currently being made from digital downloads or online advertising. Arin Crumley and Susan Buice built awareness for their feature “Four Eyed Monsters” through a series of video podcasts. They then made their film available for free on YouTube and MySpace, where it was viewed over a million times. Arin and Susan made money through shared ad revenues and Spout.com sign-ups, and then snagged a deal with IFC for domestic television and home video distribution. Wayne Wang will follow in their footsteps when he premieres his new feature “The Princess of Nebraska” on YouTube October 17th. The power of the internet was also demonstrated by the remarkably successful documentary, “The Secret.” During the first stage of its release, “The Secret” could be streamed or purchased at the film’s website, but was not available in theaters, on television, in stores, or on Amazon. During the next stage, the book was launched by Simon & Schuster in bookstores and online. After the book shot to the top of the bestseller list, “The Secret” DVD was finally made available in retail stores and on Amazon. Over 2 million DVDs were sold during the first twelve months of its release. 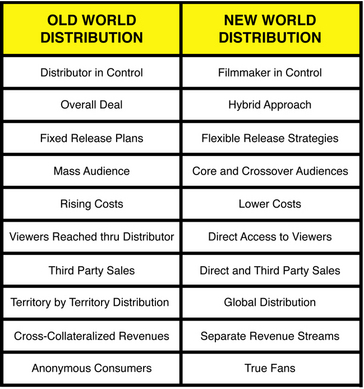 The chart above illustrates the essential differences between Old and New World Distribution. 1. GREATER CONTROL – Filmmakers retain overall control of their distribution, choosing which rights to give distribution partners and which to retain. If filmmakers hire a service deal company or a booker to arrange a theatrical run, they control the marketing campaign, spending, and the timing of their release. In the OW (Old World), a distributor that acquires all rights has total control of distribution. Filmmakers usually have little or no influence on key marketing and distribution decisions. 2. HYBRID DISTRIBUTION – Filmmakers split up their rights, working with distribution partners in certain sectors and keeping the right to make direct sales. They can make separate deals for: retail home video, television, educational, nontheatrical, and VOD, as well as splitting up their digital rights. They also sell DVDs from their websites and at screenings, and may make digital downloads available directly from their sites. In the OW, filmmakers make overall deals, giving one company all their rights (now known or ever to be dreamed up) for as long as 25 years. 3. CUSTOMIZED STRATEGIES – Filmmakers design creative distribution strategies customized to their film’s content and target audiences. They can begin outreach to audiences and potential organizational partners before or during production. They often ignore traditional windows, selling DVDs from their websites before they are available in stores, sometimes during their theatrical release, and even at festivals. Filmmakers are able to test their strategies step-by-step, and modify them as needed. In the OW, distribution plans are much more formulaic and rigid. 4. CORE AUDIENCES – Filmmakers target core audiences. Their priority is to reach them effectively, and then hopefully cross over to a wider public. They reach core audiences directly both online and offline, through websites, mailing lists, organizations, and publications. In the OW, many distributors market to a general audience, which is highly inefficient and more and more expensive. Notable exceptions, Fox Searchlight and Bob Berney, have demonstrated how effective highly targeted marketing can be. “Napoleon Dynamite” first targeted nerds, “Passion of the Christ” began with evangelicals, and “My Big Fat Greek Wedding” started with Greek Americans. Building on their original base, each of these films was then able to significantly expand and diversify their audiences. 5. REDUCING COSTS – Filmmakers reduce costs by using the internet and by spending less on traditional print, television, and radio advertising. While four years ago a five-city theatrical service deal cost $250,000 – $300,000, today comparable service deals can cost half that or even less. In the OW, marketing costs have risen dramatically. 6. DIRECT ACCESS TO VIEWERS – Filmmakers use the internet to reach audiences directly. The makers of the motorcycle-racing documentary, “Faster,” used the web to quickly and inexpensively reach motorcycle fans around the world. They pulled off an inspired stunt at the Cannes Film Festival, which generated international coverage and widespread awareness among fans. This sparked lucrative DVD sales first from the website and then in retail stores. In the OW, filmmakers only have indirect access to audiences through distributors. 7. DIRECT SALES – Filmmakers make much higher margins on direct sales from their websites and at screenings than they do through retail sales. They can make as much as $23 profit on a $24.95 website sale (plus $4.95 for shipping and handling). A retail sale of the same DVD only nets $2.50 via a typical 20% royalty video deal. If filmmakers sell an educational copy from their websites to a college or university for $250 (an average educational price), they can net $240. Direct sales to consumers provide valuable customer data, which enables filmmakers to make future sales to these buyers. They can sell other versions of a film, the soundtrack, books, posters, and t-shirts. In the OW, filmmakers are not permitted to make direct sales, have no access to customer data, and have no merchandising rights. 8. GLOBAL DISTRIBUTION – Filmmakers are now making their films available to viewers anywhere in the world. Supplementing their deals with distributors in other countries, they sell their films to consumers in unsold territories via DVD or digital download directly from their websites. For the first time, filmmakers are aggregating audiences across national boundaries. In the OW, distribution is territory by territory, and most independent films have little or no foreign distribution. 9. SEPARATE REVENUE STREAMS – Filmmakers limit cross-collateralization and accounting problems by splitting up their distribution rights. All revenues from sales on their websites come directly to them or through the fulfillment company they’ve hired to store and ship DVDs. By separating the revenues from each distribution partner, filmmakers prevent expenses from one distribution channel being charged against revenues from another. This makes accounting simpler and more transparent. In an OW overall deal, all revenues and all expenses are combined, making monitoring revenues much more difficult. 10. TRUE FANS – Filmmakers connect with viewers online and at screenings, establish direct relationships with them, and build core personal audiences. They ask for their support, making it clear that DVD purchases from the website will help them break even and make more movies. Every filmmaker with a website has the chance to turn visitors into subscribers, subscribers into purchasers, and purchasers into true fans who can contribute to new productions. In the OW, filmmakers do not have direct access to viewers. indieWIRE’s coverage of IFP’s 208 Independent Film Week will continue throughout the week in our special New York section. Part two from Peter Broderick will be published tomorrow (Tuesday) at indieWIRE.com.